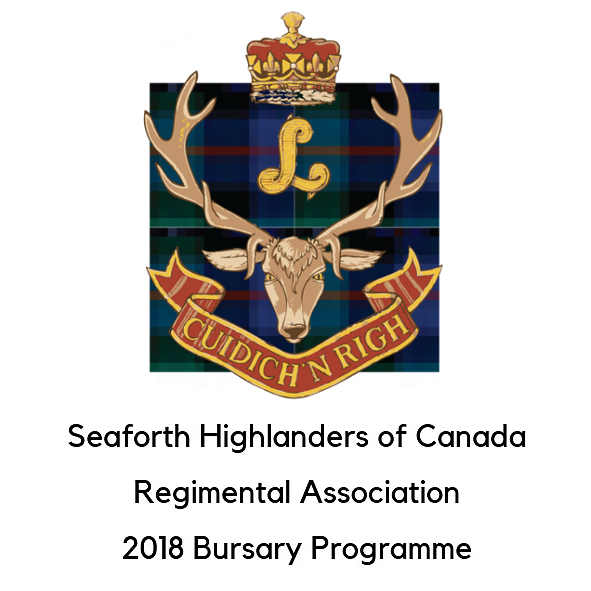 This academic year the Seaforth Highlanders of Canada Regimental Association is offering two $500 CAD bursaries to currently serving Seaforths (including members of their family) or to serving Seaforth RCACC cadets. The deadline is November 30th, 2018 and the bursaries will be presented at the 2018 Ortona Dinner in December. 1. There are two $500 bursaries available. 2. It is the responsibility of the applicant to fully complete the application and ensure that any additional information is submitted to the Regimental Association by the deadline date. 3. The applicant must provide a copy of their most recent academic transcript. 4. The applicant must provide a statement setting forth their academic / career goals or intent on completion of programme. 5. Bursaries will be awarded to two students wishing to attend or who are attending a university, college, or an approved school for vocational or technical training in Canada.